How well do you remember the letters written to you? Let the morning bring me word of your unfailing love, for I have put my trust in you. Show me the way I should go, for to you I entrust my life (Psalm 143:8 TNIV). Not long ago, my wife and I were cleaning out one of our closets. On the top shelf, in the back of the closet was an unmarked box. So I pulled it down and was surprised to see that inside of it were all the "love letters" that I wrote to her while we were dating. Well, I had forgotten what I had written, so I pulled out a few to read. Oh my! Talk about corny and embarrassing! Someday my children will get a kick out of reading Daddy's love letters to Mama. How well do you cherish God's love for you? 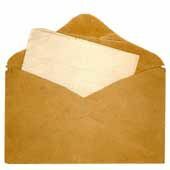 But as I took a break to read some of these letters to my wife, I found that she remembered them. They weren't strange words to her. While I had no memory of these letters, and was busy analyzing handwriting samples to make sure I indeed wrote them, my wife needed no such analysis. She knew the letters were from me, and she remembered the very words I had written. The fact that she remembered my letters so well indicates that those letters were cherished by her. Now here's my point: How well do you cherish God's love for you? You do know that he has written several "love letters" to you, don't you? Have you forgotten their content? Have you even taken the time to open and read what He had to say to you? I might go so far as to suggest that the way we cherish — or fail to cherish — His words is an indicator of the depth of our love for Him. Give it some thought. "Love Letters" by Steve Higginbotham is licensed under a Creative Commons License. Heartlight encourages you to share this material with others in church bulletins, personal emails, and other non-commercial uses. Please see our Usage Guidelines for more information.